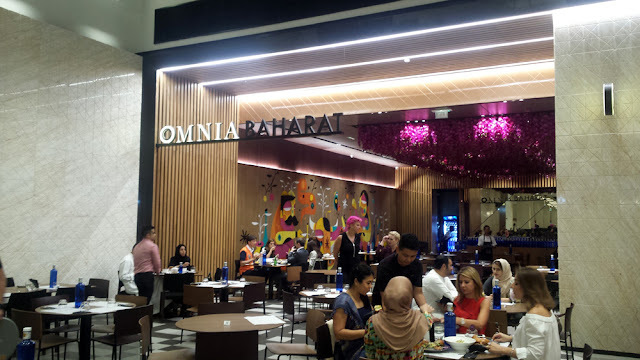 Yesterday we were invited by star chef , food writer and television personality Silvena Rowe to her new restaurant "Omnia Baharat" , -her fifth restaurant in Dubai in less than a year and a half , impressive right? 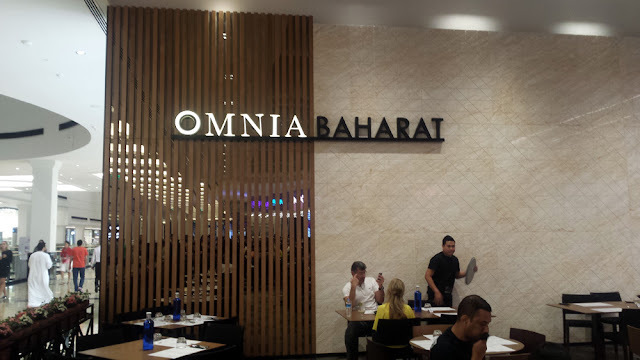 !- a burger and lobster place that just opened in Mall of Emirates . Just like the other Omnia restaurants , 'Omnia Baharat' is beautifully decorated , very modern and clean , with a touch of vibrant colors . امس كنا مدعويين من طلف الشيف المشهورة و الكاتبة و الشخصية الاعلامية , شيف سيلفينا روي لمطعملها الجديد الذي ففتتح مؤخرا في مول الامارات و هو خامس مطعم للشيف سيلفينا في دبي في اقل من سنة و نصف, و هو متخصص في اطباق الكركند و البيرقر . الديكور في مطعم " امنية بهارات" علي غرار باقي مطاعم سلسلة "امنية" , مميز ببساطة ممزوحة مع الوان فاقعة و اشكال هندسية راقية . Crispy prawn popcorn with red harissa . this dish is just perfect , everything you'd want your fried prawns to be , very well seasoned , crispy and light as they're fried in olive oil , and the Harissa was wonderful , i wish chef Silvena had jars of it to sell ! روبيان مقرمش مع صلصة الهريسة . 29aed . with cheese 34 aed . Grain fed Aberdeen Angus patty with lettuce, tomato , red onions , and Omnia sauce . I gave it and A and my husband gave it and A-. A go to burger , that would satisfy all tastes , the patty is pretty soft and tender and i have to say that the pickles was the cherry on top , so yum ! 29 درهم و 34 درهم مع الجبنة. لحم عجل انقوس المغذى علي الحبوب مع طماطم و خس و بصل احمر و مخلل مع صلصة امنية . اعطيته علامة A و زوجي اعطاه علامة A- . برقر بسيط ,قطعة اللحم المفروم لذيلة و رطبة و احلى شيء هو المخلل الذي اعطى حدة للشطيرة . Lean ground lamb kashkash kebab patty , topped with oozing cheese, red onions,tomato,lettuce and Omnia sauce . Delicious kebab patty , rich in flavor . My husband loved the barbecue taste in it , and liked the portion size . لحم ضأن مفروم ناعم ببهارات الكباب، مع طماطم بصل و جبنة و صلصة أمنية. أعطيه علامة A- و زوجي أعطاه علامة À. لحمة بطعم الكباب غنية بالمذاق. زوجي اعجبه طعم الشواء و حجم القطعة كونها معقولة. Triple cooked home made fries. Cooked in olive oil. Beautiful slim cut potato fries super delicious I give it an A++.. Does taste like just any potato fries it's a kind of it's own. بطاطس مقطعة بشكل أصابع رقيقة و لذيذة جدا أعدها علامة A++... صراحة هذه ليست بطاطس مقلية تقليدية ابدا.. I think I just found my new favorite tiramisu! It's so rich and creamy yet light. I loved the coffee sauce with the bitter chocolate. Just perfect for people who like a not to sweet dessert. .
Home made date ice cream. My husband gave it an A. Unlike me my husband is a big fan of sweet foods and this date ice cream would be perfect as a fix for a sweet tooth. على عكسي فزوجي يحب الأطباق الحلوة و ايسكريم التمر هذا حلو جدا و سيعجب الأشخاص الذين يحبون الحلاوة. Last but not least the service was very good , the staff is warm and welcoming and deserves an A+.